UDM Downloads > PDF File Converter Pro! PDF File Converter Pro is a powerful application that provides full control over PDF documents. You will convert PDFs to editable Word and Excel documents with just a single mouse click. It also offers conversion from PDF to HTML, JPEG and TIFF. 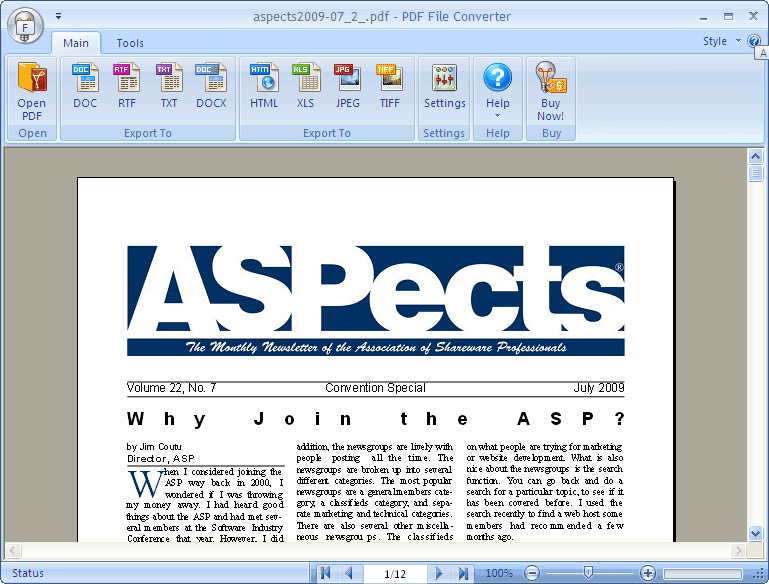 With this program you will split, merge and extract PDFs and also delete or insert pages from and into a PDF document. It offers various conversion methods which include exact conversion from PDF to Word that retains the whole content of the document or a conversion which keeps only the text and deletes the images. You will also be able to use several styles of HTML conversion convert PDFs to a single continuous HTML, convert each PDF page to a separate HTML or to an HTML that scrolls through pages by using buttons. You will also control the quality and the resolution of JPEG and TIFF conversions. This program offers a user-friendly interface that very easy to use plus a Quick Access customizable toolbar. It also integrates with the system menus of MS Windows and MS Office for even easier and faster conversion. Just right click on a PDF file and select the conversion you wish to do. Free technical support and money back guarantee.